ANSPIT calculates groundwater inflow to an open pit based on selected conceptual scheme, pit layout, specified time and target drawdown. It is assumed that dewatering is achieved by in-pit sumps. 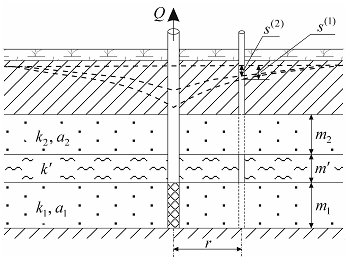 For the analytical schemes of unconfined aquifer and linear source in confined aquifer, the algorithm takes into account the excavation depth of the pit. 1. Manually – by entering value in the text box "Radius". Field shows calculated pit inflow (m3/d) for in-pit sumps with de-activated abstraction wells. CTRL-LMB – opens conversion table for time units. If you enter pit inflow value in this field, pit drawdown will be calculated and displayed in frame "Target drawdown"
Maximum bound of X-axis. Minimum bound is assigned equal to the values of time or drawdown entered in frame "Target drawdown"
Plots pit inflow versus logarithmic time. Time values range from the value assigned in text box "Time" of frame "Target drawdown" to the value specified in the text box "Xmax"
Plots pit inflow versus drawdown. Time values range from the value assigned in text box "Drawdown" of frame "Target drawdown" to the value specified in the text box "Xmax"